French Emblems: Emblem: Hinc dolor; inde fuga, gravis. Hinc dolor; inde fuga, gravis. Pain on the one hand, or flight on the other, is harsh. Mentem intus exest vulnus atrox nimis. Stag, pierced by a Cretan shaft, why do you slacken your reins in your headlong flight? This is the fate of the lover, whom flight is spurring on: The dreadful wound within is preying too much on his mind. Favete linguis, carmina non priùs. The verse-form is an Alcaic dactylic monocolon, consisting of an iambic penthemimeris and a double dactyl, like that line of Horace’s:“Hold your tongues: songs previously un[heard]”. 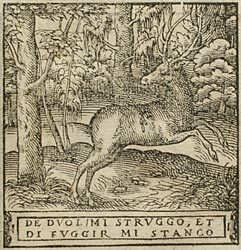 A Stag is depicted in headlong flight, but with his neck bent back somewhat to look at an arrow protruding from a wound, so that the sensation of pain might somehow be expressed. The meaning of this is from that line of the Tuscan poet [Petrarch], which could indeed be included without incongruity: DI DUOL’ MI STRUGGO, ET DI FUGGIR’ STANCO (Tired by flight, by anguish I’m hard pressed). Whoever is sick at heart and hopes that he can alleviate the hateful torment [lit. the hatefulness of the torment] by travelling and running over the sea: he is not unlike this Stag. For he carries around in his soul both the pain of the wound [lit. the wound of sickness] and the means of alleviating it, [p.139] and in throwing himself upon the kindness of strangers, if he is badly treated, he grows weary, and adds to the bitterness of the wound.